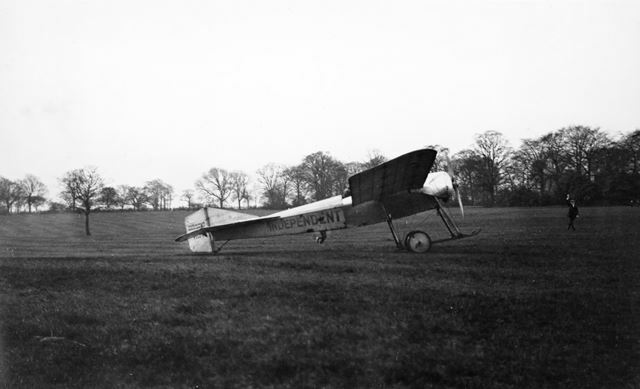 A Blackburn Type 1 aeroplane having landed on fields at Brookside, Brampton. The plane appears to be taxiing into position. Three of these single-engine two-seat monoplanes were constructed by the Blackburn Aeroplane Company and were used for flying demonstrations and training. Each was powered by an 80hp Gnome engine. This photo has been dated as c 1913 but the date is almost certainly 4 April 1914 when the first-built Type 1 aircraft took part in the Sheffield Aviation Week and was sponsored by the 'Sheffield Independent' newspaper (hence the word 'Independent' applied to the fuselage). Aviation pioneer Harold Blackburn (1879-1959) offered joy-rides and accompanied by a young lady known as 'Little Miss Independent' he delivered the early edition of the paper to Chesterfield by air.